Inspired by the Shaker #4 rocking chair, which has a strikingly contemporary proportion, it is particularly wide, with a low profile making it comfortable and inviting. Our version is made in solid maple with geometrically minimal forms. It has a spindle back atypical of Shaker Rockers. Based on the Shaker quote “do your work as if you had a thousand years to live and if you were to die tomorrow”. This table is built to last. Borrowing elements from several Shaker Trestle tables, including a high stretcher and the use of metal hardware for easy disassembly. This table is made from old growth Douglas Fir and generously supports activities from family meals, projects to office work. One half of the top slides to accommodate cords and plugs. Oversized metal hardware and sliding dovetail joints make it extremely durable and allow the table to be completely dismantled for ease of shipping. Based on Shaker benches with removable backs. This updated version uses oversized hardware to connect the backrest. The slab built construction has a shallow V shaped seat to give added comfort Disassembles completely and packs flat. Inspired by the construction of the Shaker bentwood oval boxes and the forms of woven split black ash harvest baskets. Utilizing a modern flexible bamboo plywood and solid plywood base allows for bentwood forms that are not possible with traditional methods. They are extremely light and durable, suitable for many uses. Butter is a staple of the Shaker table, We developed a simple butter dish with a knife that registers into the dish, inspired by a Shaker bread cutting board with an attached hinged knife. Everything in its place. Inspired by the many types of hanging utensils (typically metal) and wooden tools made by the Shakers. We developed a set of utensils that referenced these as well as the wooden peg rail, shrinking it down to the scale of kitchen utensils. Creating a set of essential tools that were always accessible when cooking and graphically pleasing when put away. Wooden utensils attach to the rail with integrated magnets. Inspired by the Enfield Shaker dining chair, the bar stool has a compact but comfortable seat with a low backrest and footrest at just the right height. Swivel is discretely integrated into the bottom of the seat. 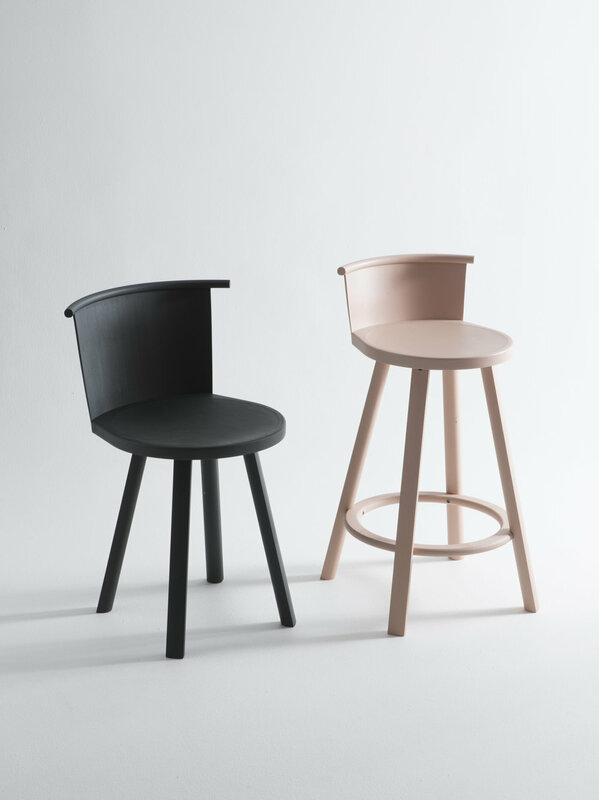 Inspired by the Enfield Shaker dining chair and the Shaker revolving desk chair. It has compact seat with a low back and a swivel discretely integrated into the bottom of the seat. A useful container for storing and transporting things, the Caddy works as a toolbox or storage for kitchen or desktop tools. The large central handle keeps the lid securely in place and invites you to pick it up. The lid also functions as a tray for holding smaller items or thoughtfully displaying individual contents. A combination of an old picture rail used for discreetly hanging artwork without putting a nail in the wall, and a restaurant ticket holder. A row of glass marbles in a wooden block securely holds a range of items including grocery lists, postcards and posters, or sits by the door to hold letters to post. A series of domestic tools each subtly integrates an elevated technical feature – a ratcheting screwdriver with replaceable bits, a hammer with a magnetic tip to hold nails and tacks to keep from hitting thumbs, a simple wooden level. These tools are for serious work but don't look out of place when left out on the table. Nothing tastes better than a well-prepared meal after working outdoors. This light and durable basket is based on traditional Shaker baskets and the Korean Kwang Juli basket for the Secham meal, where a home cooked meal is brought to field workers, with fresh greens harvested onsite to complete the meal. Studio Gorm come to design from backgrounds in sculpture and craft. Their methods are strongly rooted in physical making from traditional craft processes to digital fabrication, where objects evolve out of an experimental constructive approach to design resulting in products that are simple practical and thoughtfully made. Both John and Wonhee are Professors and founding members of the Product Design Department at the University of Oregon where their research focuses on studying the past and speculating about the future in order to design useful objects for today.